This water lily greets early morning jogger around the lake when this image was captured. Wonderful! I love the black background, very good capture. A very artistic presentation of this water lily with a black BG to boost forth the flower! Very fine sharpness in the heart of the flower adorned with perfect diffused lighting. Fabulous details in the stamens and very natural colors. This is a wonderful presentation and I specially like your DOF and the defused effect here...very well done! 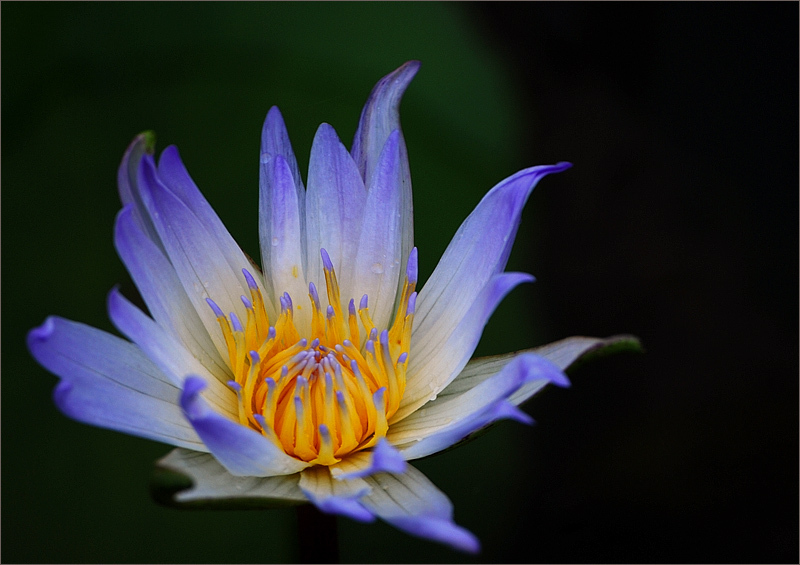 A lovely glowing water Lilly captured under diffused light and beautiful colors. A lovely closeup capture from a waterlily with nice colors and details! The POV is excellent and clarity is amazing. The focus is spot-on and the contrast between the violet flower and the dark BG, is wonderful. As i am taking note of the date taken : the 6th and of the submitted date : the day before i get a feeling of superb freshness out of this capture Jusni , hi hi , oh ya being some 13 or so hours ahead of us here on the eastern coast of N Am you guys are up and about for the new day while we are preparing to go to bed for the night you already slept through , hey hey it is the first time i ever notice that 'time anomaly' in the photo information , of course US time is the set standard time for this site , well i am going to get over that ,lol ! Beautiful and very artistic approach.Excellent colour saturation on the lilly with a strong contrasting BG. Quel superbe gros plan sur ce magnifique n�nuphar aux couleurs fabuleuses et les d�tails nettement en relief!!! Excellent Point of view and details. Hi,this is one of the most magical flower shots I have seen.The colors and textures are well contrasted by the black background and make the beauty of this flower stand out.Best wishes Otto.